PFLAG continues to prove that parental support is powerful. What started as a self-help support group has since transformed into the vibrant national organization it is today, with nearly 400 chapters across the country (including in Puerto Rico) providing support, education, and advocacy to the family and friends of LGBTQ people. This August, Verizon showed its gratitude by presenting PFLAG — which the company has supported since 2002 — with $250,000. “Thanks to Verizon’s generosity, we will grow and strengthen the PFLAG chapter network, connect and keep families together, further family acceptance and ally activation, and reinforce our chapters’ ability to be a powerful source of peer-to-peer support, education, and advocacy in their communities,” said Jean Hodges, president of the PFLAG National board of directors, in a statement to the press. 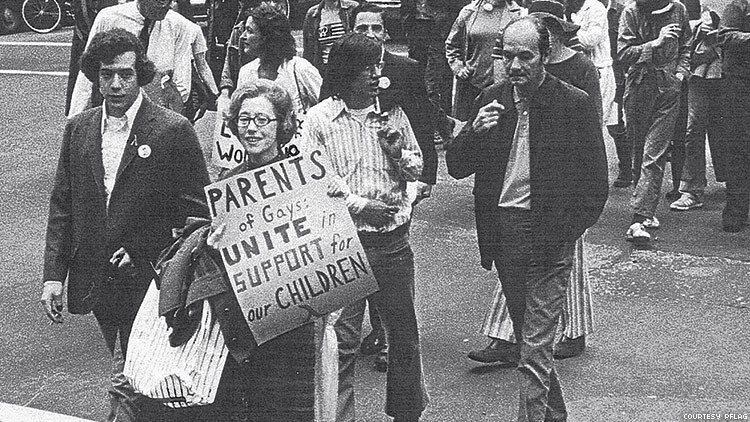 Today, PFLAG has hundreds of thousands of supporters in the U.S., and it has launched a global movement that continues to show how powerful outspoken and supportive parents can be — and not just for their own kids.